After Chef Alex Harrell closed his French Quarter restaurant Angeline last June, fans of his creative Southern cuisine were eager to see him back in a kitchen. They got their wish when Harrell was tapped to run The Elysian Bar, the restaurant and café connected to the new Hotel Peter and Paul in Faubourg Marigny. A four-year renovation transformed the former Sts. Peter and Paul Catholic Church and school into a setting unlike any other in New Orleans – more Burgundy, France than Bur-GUN-dy Street. It’s a string of nooks, warmed by gingham upholstery, fireplaces and greenery, that meanders from front parlor to glassed-in dining room to an elegant bar and courtyard. During the day, the parlor pairs nicely with coffee and a warm cheddar and chive biscuit (and a copy of the New Yorker from the well-appointed magazine cart). But sunset transforms the cozy café to evening chic. Guided by those parameters and a long-held devotion to seasonality and local sourcing, Harrell designed a Mediterranean-inspired menu that expands as the day goes on. Portions are generous and shareable. Eggs are an outstanding option – at all hours. 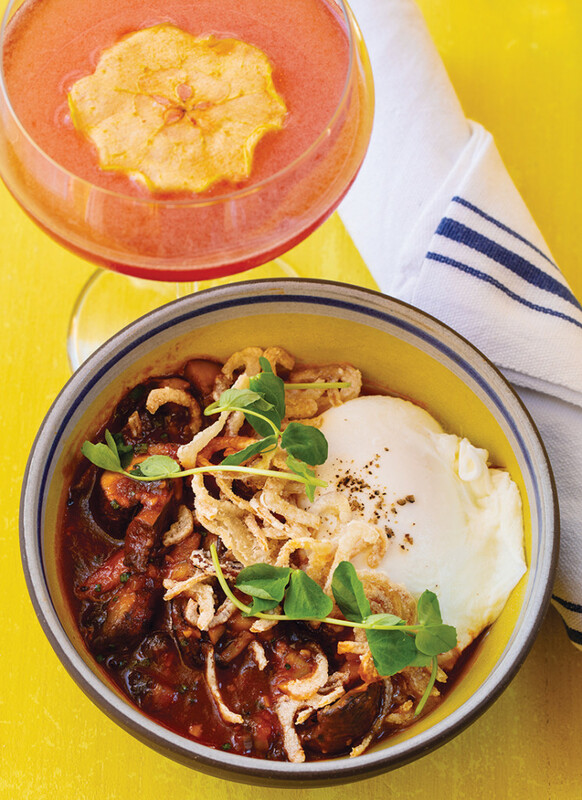 The heirloom red corn grits (grown in Harrell’s home state of Alabama and milled locally by Bellegarde Bakery) feature an expertly poached egg with tomato-braised mushrooms and a dollop of crisp shallot rings. Another winner is the zesty house-made chorizo with a fried egg, kale and mixed grains. Harrell grew up eating produce from his grandparents’ one-acre garden, and vegetables remain close to his heart. Diners who enjoyed the chef’s Brussels sprouts at Sylvain or cauliflower at Angeline will be pleased to find tributes to both, the Brussels sprouts fried and flavored by smoked almonds, pickled raisins and bagna cauda. Don’t miss the real star, however – the quirky fermented cabbage flavored with guanciale, bottarga breadcrumbs and a hint of grainy mustard. It’s Harrell’s favorite, the result of an experiment that started with grilled cabbage and evolved into something much more original. The Elysian Bar, 2317 Burgundy Street, Faubourg Marigny, 356-6769, theelysianbar.com. Coffee 7 a.m. to 4 p.m.; Café and bar 10:30 a.m. to midnight. No reservations. The Delachaise, 3442 St. Charles Avenue, Uptown, 895-0858, thedelachaise.com. D Nightly. L Fri-Sun. For those who enjoy cozy corners, the jewel box setting of The Delachaise on St. Charles Avenue houses an extensive wine selection and the city’s most addictive pommes frites. If you can see past the frites, try the house-made pâté or one of the innovative daily menu specials.